Ooze glamour and style with this breathtakingly beautiful necklace from Mikey. 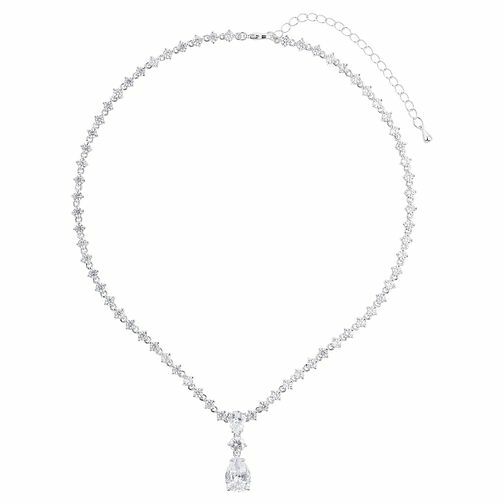 Set in a sleek silver tone, this necklace features a string of shimmering clear crystals leading to a drop pendant featuring three larger crystals for a show-stopping look. London based jewellery designer Mikey specialises in unique, wearable glamour for all occasions. Mikey Silver Tone Crystal Set Drop Pendant is rated 5.0 out of 5 by 1. Rated 5 out of 5 by Anonymous from Super sparkly! An eye catching piece. My now husband bought this for me as a wedding gift to wear on our big day. I absolutely love it!! It went amazing with my wedding dress, sparkled in the sunlight and looks stunning in the photos! Perfect if you love a bit of sparkle like me!